Certain planting situations require special planting methods. 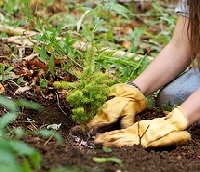 A few simple tips will help you plant your evergreen right. Ideally the root ball and soil should be removed from the container with as little disturbance as possible. If the soil is quite wet or saturated, much of the soil may fall from the root ball when you remove it from the container. Wait for the soil to dry to a slightly moist state. To remove the root ball from the container, grasp the trunk near the root ball. While holding the container firmly, gently and slowly pull upward on the trunk. Often the root ball will slip right out of the container, but you may need to cut open the container to remove it easily. Just slice down the side, and across the bottom if necessary, with a hacksaw so that you can ease open the container. Also remove any biodegradable containers, they will only slow down the root development. If the evergreen is not well rooted in the container the soil will also fall easily from the root ball so work slowly right alongside the prepared planting hole so that you disturb the roots as little as possible. Once removed from the container, if you see that the roots have filled the container and have grown around and around the pot your evergreen is rootbound. The roots at best will have a very difficult time spreading through the soil to anchor it well and may girdle, or strangle, your plant. If the problem is not severe you may be able to separate and spread out the roots by hand, gently pulling them apart. If it is severely root bound, cut a few slices down the side of the root ball and slice an X across the bottom with a sharp knife to separate the roots. At this point, do not worry about disturbing the root ball, that is exactly what you want to do. The plants are tough enough to endure a clean cut but may not be able to recover from being root bound. Generally the large evergreens have a generous root ball wrapped in burlap. They are large, heavy and hard to handle, but the large heavy ball of soil and roots is essential for mature evergreens. Most likely you will need to have it delivered and planted for you, the plant will be placed in a hole by a machine. But on occasion I have seen slightly smaller balled and burlapped evergreens that may be manageable if you have enough strong bodies available. Follow standard planting instructions but allow for settling if you loosened the soil deeper than the root ball, the entire plant may settle a couple of inches leaving your plant too deep. Err to the high side with balled and burlap, potentially leaving the top of the root ball an inch or two higher than the surrounding soil level. Leave the burlap in place until it is properly positioned in the hole. Once positioned remove all string or wire from the ball. Loosen and remove the burlap from around the sides of the soil ball. The burlap can be tucked under the root ball and will decompose. I prefer to remove anything that may inhibit root growth by cutting away the excess burlap. What little is left under the ball will rapidly decompose. Young evergreen seedlings are widely available for mass plantings. They may be bare root or in small containers. The roots and small containers can dry out very quickly so make sure they are keep moist and not exposed to the air to dry out right up until they are in the soil. Prepare a good hole. Even these tiny seedlings need a well prepared planting site. The hole should be large enough to spread the roots out well and deep enough to allow for the full length of the roots without bending them. Position the roots so that they are fully under the soil but do not bury any of what will develop to a trunk. Tamp the soil quite firmly so that the seedling is held erect. 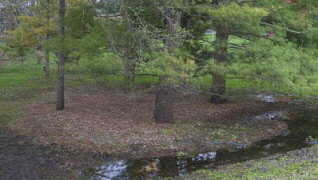 Continue to back fill as watering settles the soil so that there are no air pockets exposing the roots. Be sure the soil is kept moist in the first few weeks and weekly thereafter until the plant is well established and begins to show good growth. You may want to protect young seedlings from nibbling critters by erecting a wire fence around it. Poorly drained soil, planting too deeply and winter drying are the most common causes of damage or death of needled evergreens. They can be killed easily by water standing at their roots. They must be planted in well-drained soil. In the coldest climates make sure the root ball is planted at or even ever so slightly below the surrounding soil level and mulch heavily. This will help insulate the roots in winter and help to prevent heaving in freeze thaw periods. It is critical that your soil be well drained if you plant a little deep. The heaviest of sticky clay soils will need a large hole well amended with soil conditions to improve the drainage. In warmer regions with heavy clay the root ball may be planted about an inch above the surrounding soil level to avoid the problems of poor drainage.